Russia’s troubled Phobos-Grunt probe, stuck in the wrong orbit for more than a month, appears to be headed for a fiery and uncontrolled fall back to Earth early next month. Tracking experts are predicting that Phobos-Grunt will re-enter Earth's atmosphere on Jan. 9, 2012, but at present, the forecast includes an uncertainty of plus or minus 5 1/2 days. Some analysts are even suggesting that the spacecraft could see its demise as early as Jan. 1 or 2. 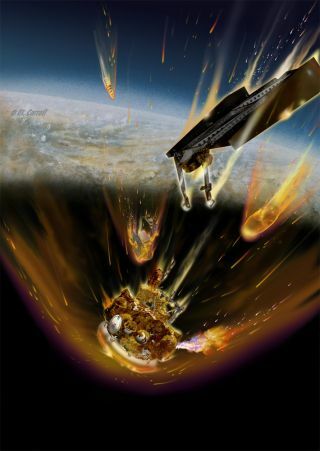 "IADC is considering to adopt Phobos-Grunt as an IADC re-entry test object," said Heiner Klinkrad, ESA’s senior space debris expert and head of the European Space Operations Center’s Space Debris Office in Darmstadt, Germany. "A final decision, in accordance with IADC’s terms of reference, still needs to be taken," he told SPACE.com. Responsibility for a project must encompass the entire lifespan and take every eventuality into consideration. National and international collaboration, regardless of whether personal or institutional, has now achieved a level that is marked by a very engaging, positive attitude and mutual trust, which must be used accordingly. Communication concerning projects should be as transparent as possible, but always reliable and correct in every respect. In this regard, successes and potential risks must be communicated equally. "It would stand to reason that a situation such as the Phobos-Grunt re-entry would call for further transparency between the nations involved, including technical data/assurances relating to the spacecraft," Listner concluded.